Another first here for this mommy. I made pimento cheese. I don't even like pimento cheese, but for you, my wonderful readers, I made it, and even ate it! 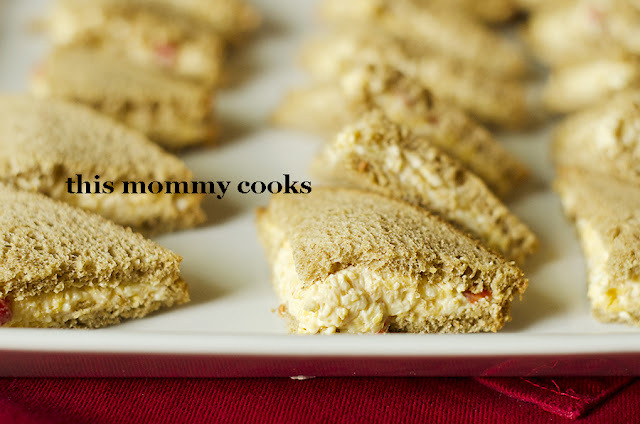 I think every good cooking blog, especially those in the south must have recipes for certain things, and pimento cheese is one of those things. My friend makes great pimento cheese sandwiches so I got her recipe and it was definitely a hit at our MOPS tea yesterday. I made this the night before and it was perfect the next day, but you could make it and serve it immediately. I served mine on thin wheat bread made by Pepperidge Farm. In a large mixing bowl, combine all ingredients, adding more sour cream or mayonnaise if needed to get the right consistency. Serve on sandwiches, burgers, or veggies. New follower...I've never had pimento cheese, I may have to try this!! I have never had pimento cheese. These look really good and easy! I pinned your crab cakes recipe to use hopefully sometime soon! Great blog! Enjoy your day!